This is a really fun call to send and receive! CLICK HERE to be directed to the Google Voice sponsored site that will help you set up and send a call to your family and friends! You can send a serious one, or a funny one. You get to type in the recipient's name, where they live, and other little details. This is my favorite site, as it is the most customizable. 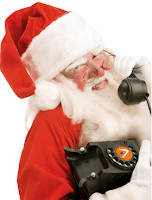 CLICK HERE to go to the site sponsored by Christmas Dialer. You get to choose from three generic messages. CLICK HERE to go to the Santa Dial site. You can choose from two different Santa voices, and three generic messages. You are limited to 3 calls sent per day. If you know of a site I have forgot, please email me at contact@enjoyutah.org. Thanks!